But there’s a reason the Tony Romo-less Cowboys are trying out the likes of Christian Ponder, Matt Flynn, Josh Johnson and McLeod Bethel-Thompson today at Valley Ranch. One of those is Nov. 2, 2014. Surely you haven’t forgotten Weeden’s only start as a Cowboy? With Romo sidelined by a back injury, Weeden stepped in against the Cardinals at AT&T Stadium and promptly threw two interceptions in a harmless 28-17 loss. He was late with throws. He was low with throws. He was 18 of 33 for only 185 yards, and his only touchdown – to Dez Bryant – came with 1:08 remaining in an 18-point game. Weeden has the tools and the experience to be better. Here’s hoping he is. But here’s lowering the bar. His passer rating for two years in Cleveland was a hideous 71.8. 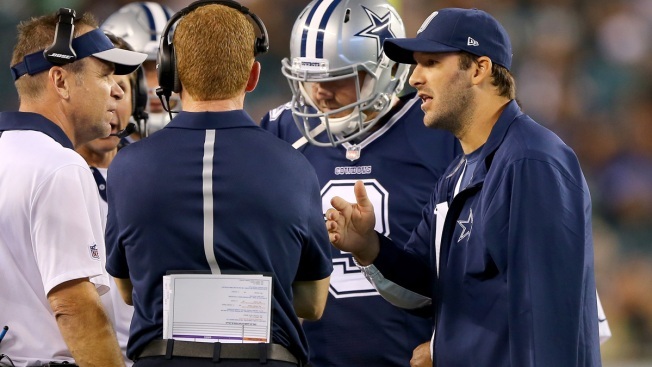 And with Romo out at least eight weeks – the planned return is Nov. 22 at Miami – this isn’t a one-game cameo. It’s essentially the Cowboys’ season. So stop with the nonsense of Robert Griffin III, Tim Tebow, Kyle Orton and even Vince Young, and let’s find a plausible Plan C for when Plan B (Weeden) falters. Finding a quarterback off the street is always dicey, but there are legit players in town today. To me, signing Ponder makes the most sense. He has thrown 38 touchdowns in the NFL, though going only 14-21-1 as a starter with the Vikings. But as recently as 2012 he went 10-6 with the Vikings. Johnson is 0-5 as an NFL starter. Flynn emerged as the Packers’ savior when Aaron Rodgers went out with a collarbone injury in 2013, going 2-2 and beating the Cowboys with four touchdown passes. Bethel-Thompson was undrafted out of Sacramento State in 2010 and has spent time with four teams, though never appearing in a game. The Cowboys also have Kellen Moore and Jameill Showers on the practice squad. If they decide a trade is the best way to replace Romo, veteran options like Matt Cassell and Josh McCown might be available. Buoyed by Sunday’s showing out of the bullpen, lots of Cowboys’ fans are confident Weeden can adequately replace Romo for two months. Given his history, the lack of Bryant and the immediate challenge of facing Falcons’ head coach Dan Quinn (who orchestrated two Super Bowl defense with the Seahawks), I’m not so sure. Let’s the quarterback carousel begin.